I'm having fun trying to print small things at the moment, not something I have really done before, so after printing some rather massive things over Christmas (on Rostock - I'll post about it soon) I wanted to try the very tiny. 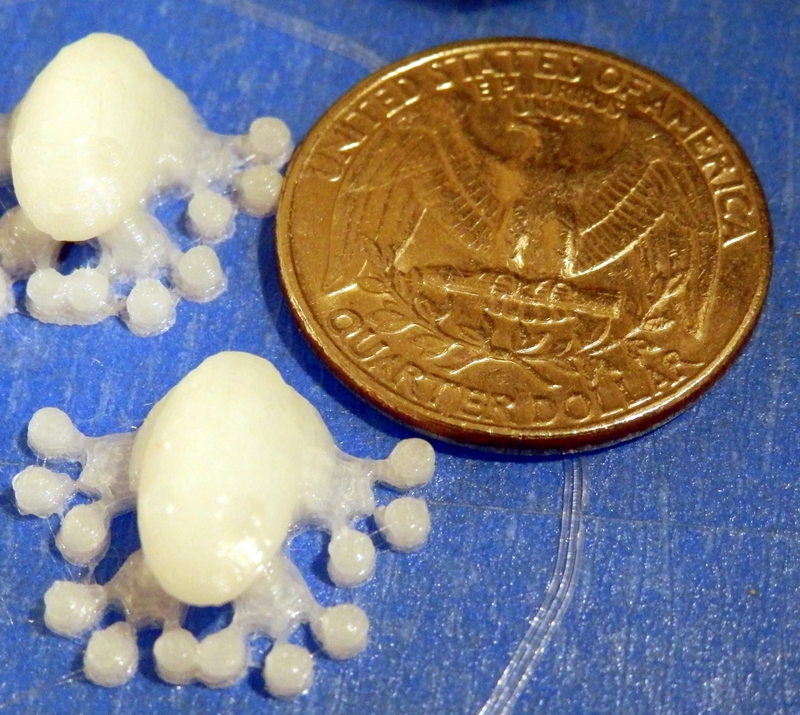 While I'm waiting for a good Resin printer design to experiment with (for small detailed prints) I decided to see how well tiny FFF printing on RepRap could look. 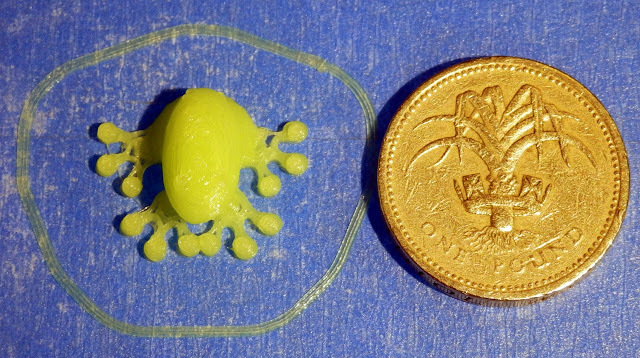 Everything below was printed on a Tantillus 3D printer with a Bowden extruder setup (again, I'll do a post about Tantillus soon), so you may even get better results with a geared non-bowden printer, do let me know if you try any tiny printing, it's awesome fun. The UK £1 coin is 22.5mm in diameter. And a USA Quarter Dollar coin is 24.26mm diameter. All the below were printed at a not so low 0.15mm layer height, so still room for improvement. First up, something for a seasonally topical print, and remember it's not all about size! 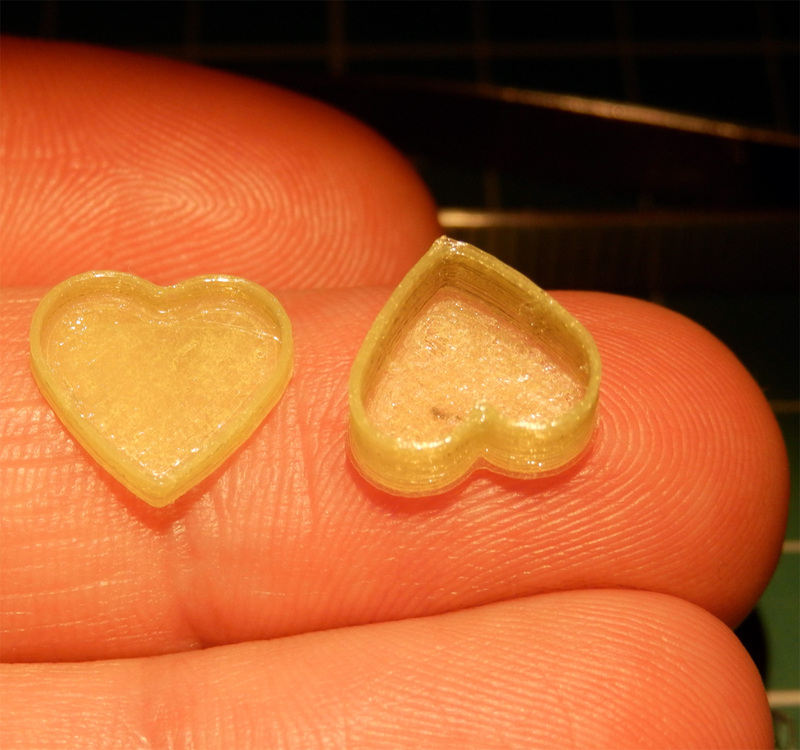 This is Nophead's great Heart shaped box, but printed at 30% of the original size - yes, the lid fits perfectly. These above are printed in natural Taulman3D 618 Nylon material, but is just as happy to be printed in PLA. Another point to mention is that this box is thing number 61 on Thingiverse, way back in the early days, if you have not yet printed it, go get the download now it's almost Valentines day! - if you didn't get the hint. PLA this time, it could do with slightly less flow. PLA needs a fan to cool as it prints, don't use a Fan for Nylon printing. And the lid still fits wonderfully, even with PLA. 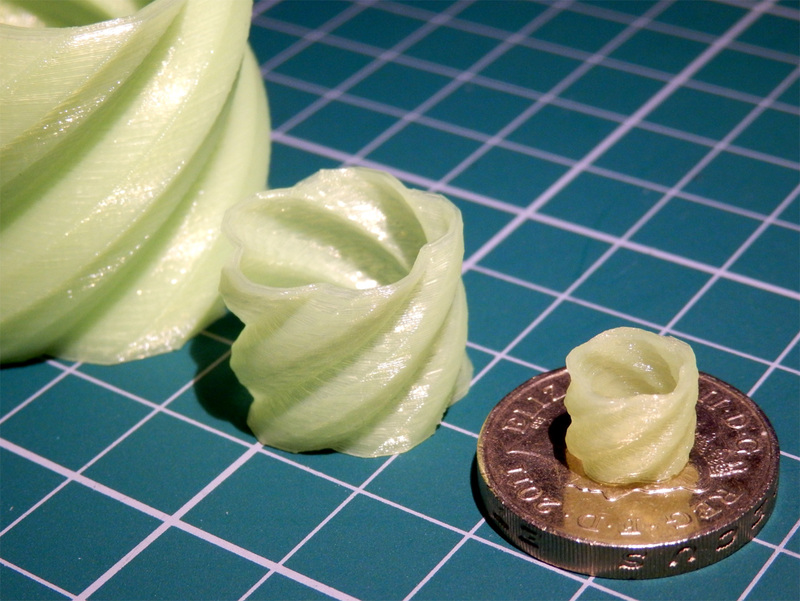 I'm printing these at quite a high speed (for the size of object) and most of the time as a single object to really reduce the chance of blobs and stringing, that has some big challenges of cooling. I spent a lot more time photographing these objects than they actually took to print, that was a major challenge in itself. Next up is the always great Frog by Owen Collins, this frog is normally 30.83mm wide and 15.28mm high, it's a reasonable challenge at normal size and you need good retraction for the feet. 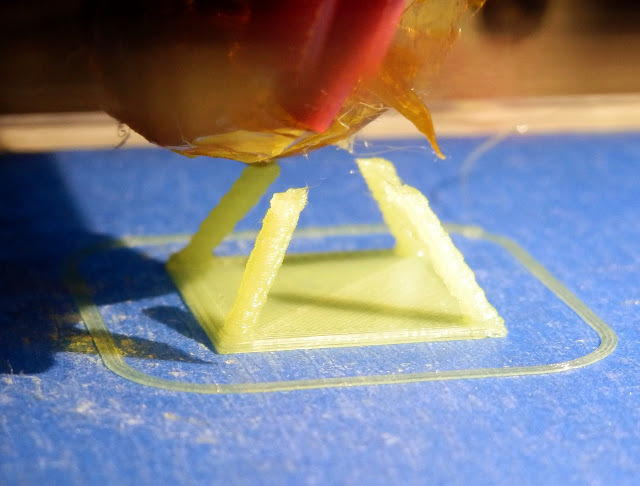 This showed up an interesting issue with Gcode infill, at this point I had calibrated my Tantillus using a very old version of Slic3r 0.7.2b as this is what's recommended with the standard configurations. You can see the infill is not complete in the feet, after playing with the settings, I moved over to Slic3r 0.9.8 and this problem completely fixed itself, with almost identical settings. If you want to try my profiles for Tantillus Slic3r Version 0.9.8 take a look at the post here for a download. Do remember I'm using 1.75mm filament on this Tantillus, so if you are using 3mm, then change the settings. I had a go at half size in Nylon, printing a plate of three at a time, as I'm not using any fan cooling at all for Nylon printing. 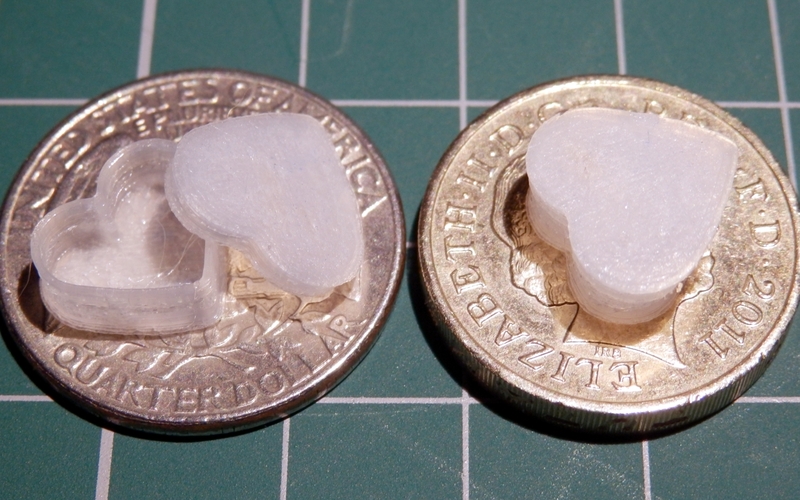 They came out better than I expected, but extruder retraction needs another 0.5mm and a reduction in flow. It's even harder to photograph the Nylon. This was one of the very first things I printed using the Taulman 618 Nylon, and a little too hot (235 degrees) for such a small print. This was the smallest frog I could manage without it breaking apart getting it off the tape. It's just 29% of the 'normal' size. 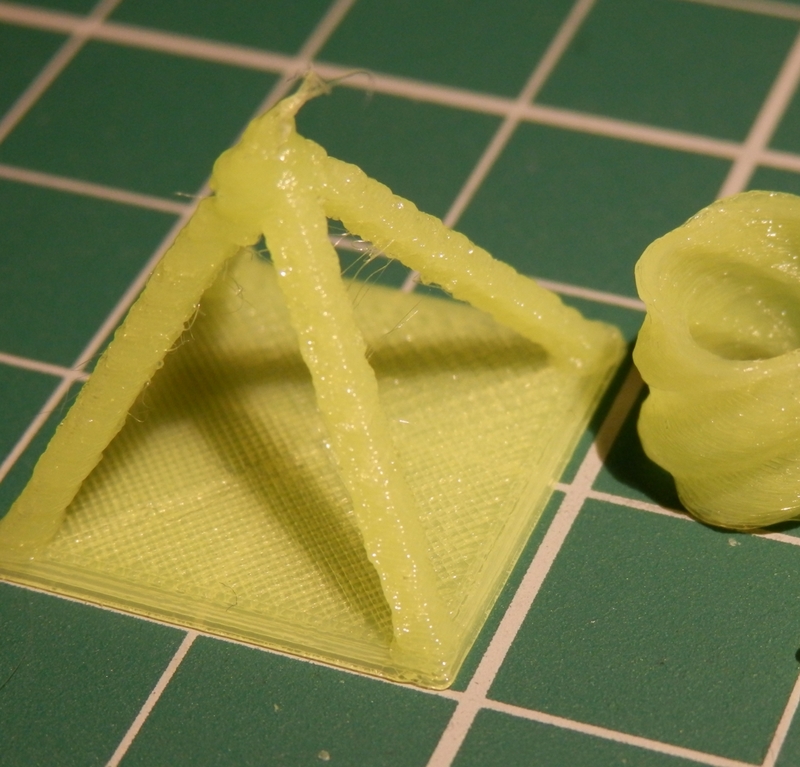 This prints well, the original has a thick wall so when scaled to 50% (middle) it has two perimeters, and at 25% (right) it has a single perimeter. The 25% one above is 10.14mm wide and 7.8mm high. This little pyramid showed up an issue with my Z Axis speed, you can see a missing (squashed) layer at the base of the arms. I'm still trying to get a good looking 40% (14mm) calibration Pyramid, this is tricky, especially the top. 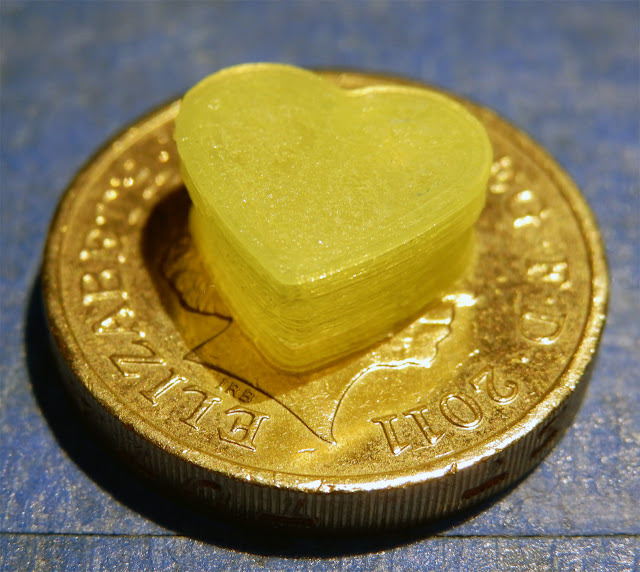 If you think you can do better, we have a 'tiny' competition on the RepRap forum here, take a look. All the scaled down models I have used above will be on the RepRap Forum competition post, if you want to try out a few on your printer. 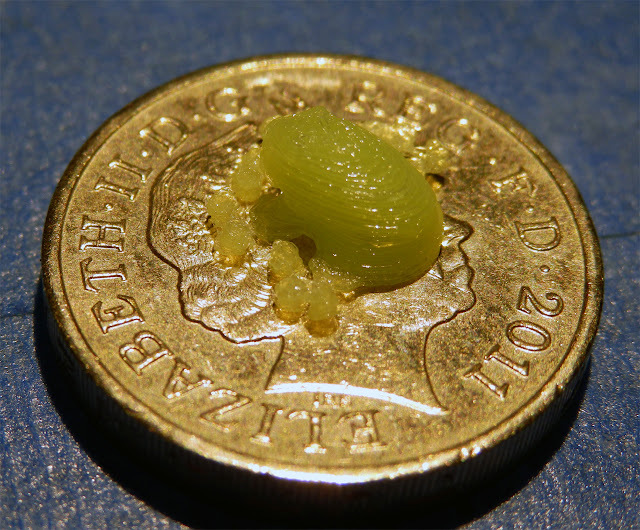 One very nice print from Petrus of a hand sitting on a 1 Euro coin - at 0.05mm layer height! And one from Gulf, Correct me if I'm wrong but that frog is sitting on a US 1 cent coin (19.05mm diameter) - Wow! Thanks for reading, and do have a go at tiny printing, and post your results (good or bad) on the forum, you never know someone may even offer a competition prize if we get a few more entries. 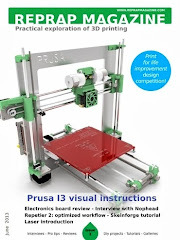 And in other news... if you are not already signed up, take a look at the rapidly growing 3D printing community on Google+ Here, it's just bust the 10,000 member mark and is a great source of news and all things 3D printable.